Why you should choose Animal Birth Control? Animal Birth Control Spay & Neuter Clinic understands that your pet is just as much a part of your family as you are. Our veterinarians and technicians have many years of patient care and surgical experience, and we are strongly committed to providing safe and gentle attention to your pet. We understand that the cost of s/n services is a major factor in delaying this surgery; A.B.C. has been established as an affordable option. Why should I have my pet’s surgery done at A.B.C.? Your full service veterinarian is equipped to manage the tremendous variety of medical and surgical problems that can confront dogs and cats. We specialize on one phase of your pet’s overall care. How can you offer high quality service at a low cost? By limiting the scope of our services, we are able to devote essentially all of our facility to a single goal. Are A.B.C.’s veterinarians licensed in Maryland? Yes. 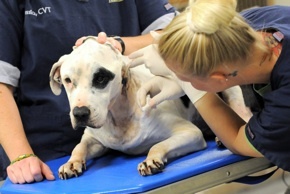 By law, only licensed veterinarians are allowed to administer anesthesia and operate. We wouldn’t have it any other way.